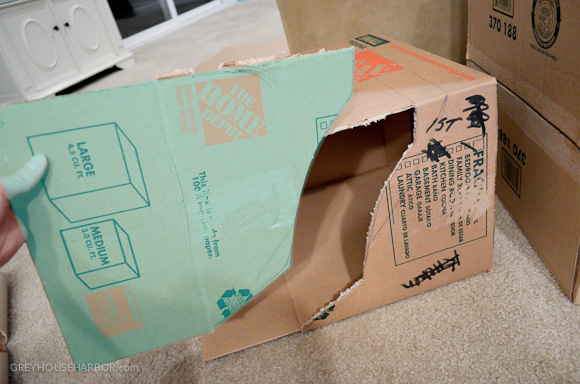 For Bug’s birthday party I put together a cardboard box construction site. 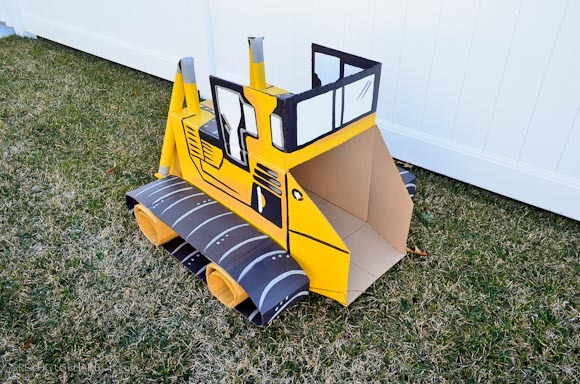 I created this bulldozer design so that small toddlers can easily get inside without having to be lifted in and out by an adult. Click HERE for the dump truck tutorial. 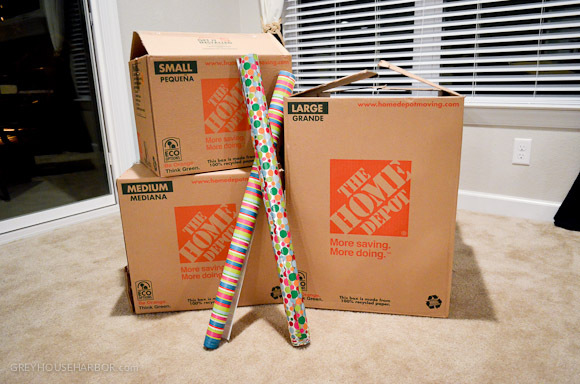 I got all my boxes for free from a neighbor that recently moved! 1. Start with the main body section. Hot glue one end of the Large box closed. 2. Measure 12″ from the glued end. 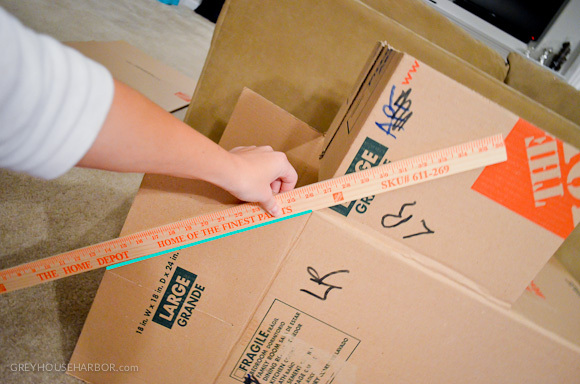 Using your yardstick as a straight edge and a box cutter, cut from one side of the box to the other. 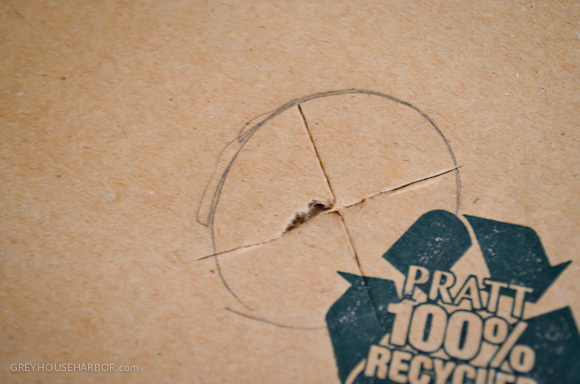 Also cut a line perpendicular through the flap on the open end. 3. 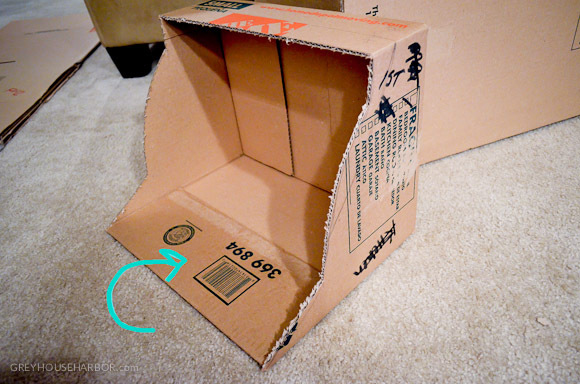 Lift up the part you cut, slightly overlap the flaps and hot glue together. 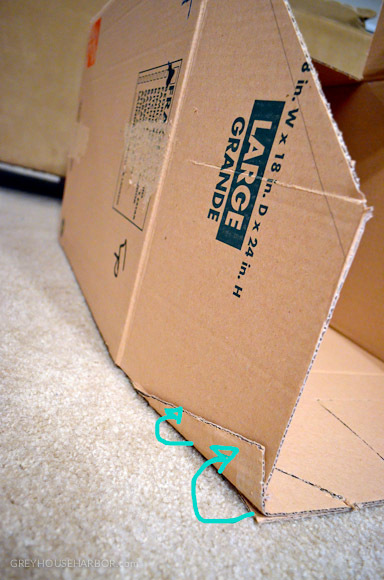 A quick tip on cutting cardboard – using the yardstick to stay straight, gently score the box several times, not cutting through. 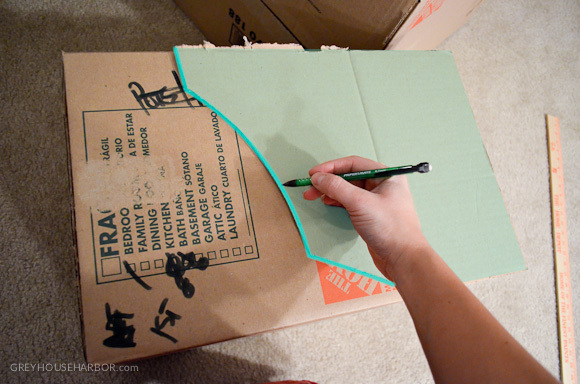 Then, bend the scored line and cut inside the crease on the other side for a clean edge. 4. 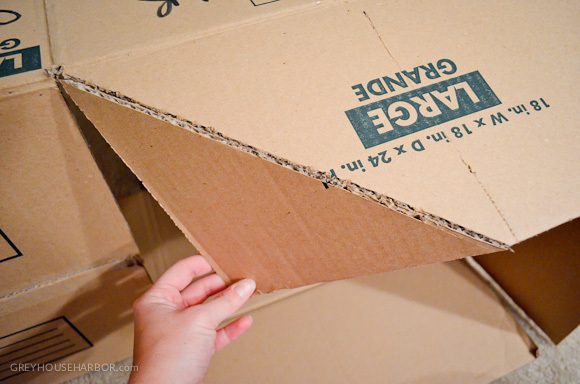 Cut the top of the back flaps at a small diagonal. 5. Angle the back flaps in slightly. 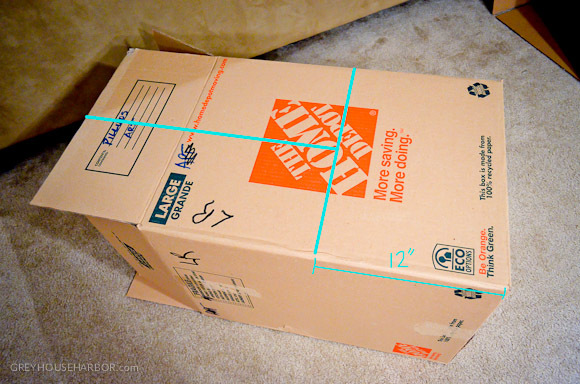 Mark line with a pencil on the bottom flap. 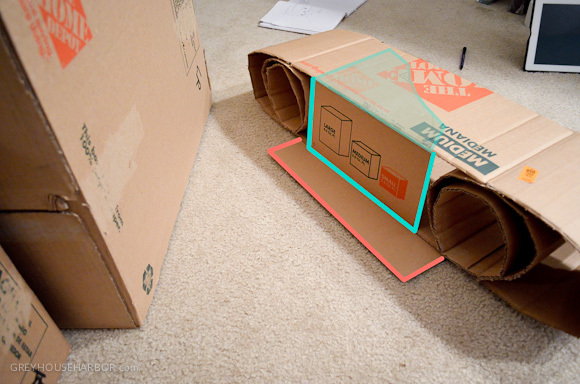 Use box cutter to score the line (don’t cut all the way through). Fold the scored part up and hot glue to back flap. This will keep all the back flaps securely in place. 6. Now let’s make the front blade. Hot glue one end of the Small box together. On the long side mark a line 4.5″ from glued end. 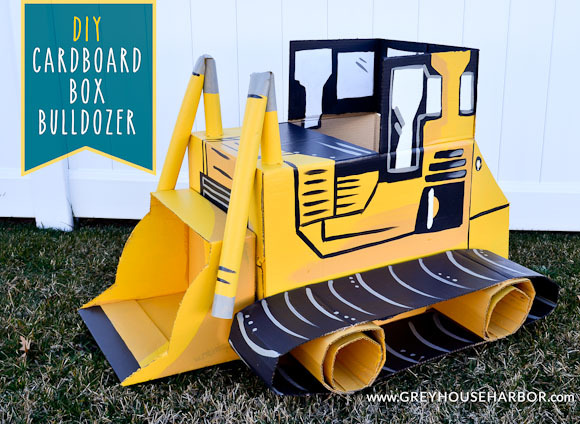 On the short side (12″ side), draw a bulldozer blade shape and cut out. SAVE THIS PIECE. 7. Take that piece, flip it over, and trace the same line on the opposite side. Cut out that side and the straight line along the top. SAVE ALL THESE PIECES FOR LATER. 8. It should look like this. 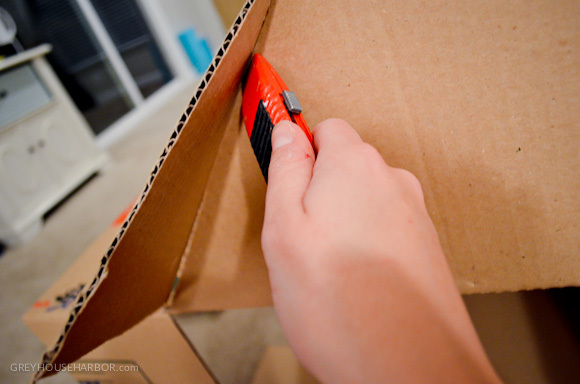 Flip the bottom flap into the blade and secure with hot glue. 9. Now for the roller tracks. 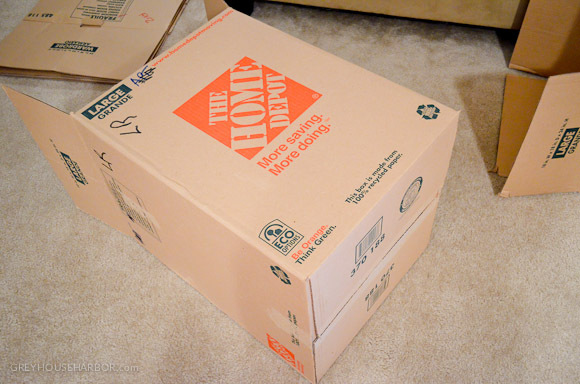 Cut all the flaps off of the Medium box. SAVE. 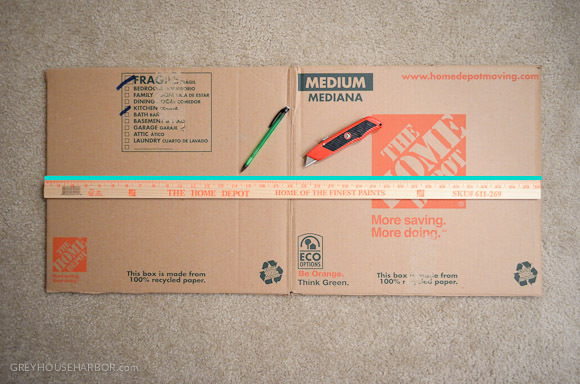 Cut the box evenly in half long-ways. 10. 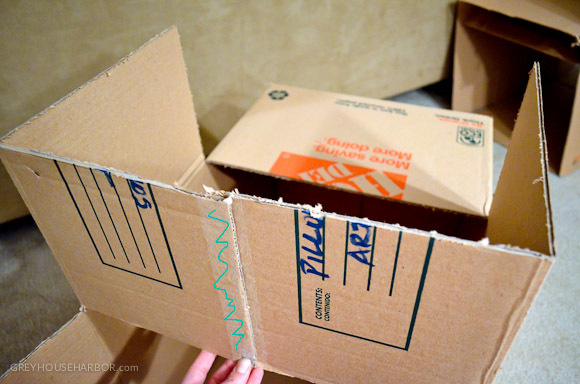 Roll one of the flaps you cut off the Medium box and glue into a cylinder. Glue another rounded flap around the first cylinder to make it taller. Set both cylinders inside the long half-box and glue together. 11. Remember those two pieces you saved from the scoop? To give the tracks some rigidity, glue them to the back & inside top of the track. Also cut the straight piece from the top of the blade cut-out in half. Glue one half-way under the bottom of the track. This will slide under and be glued to the bottom of the bulldozer body. 12. 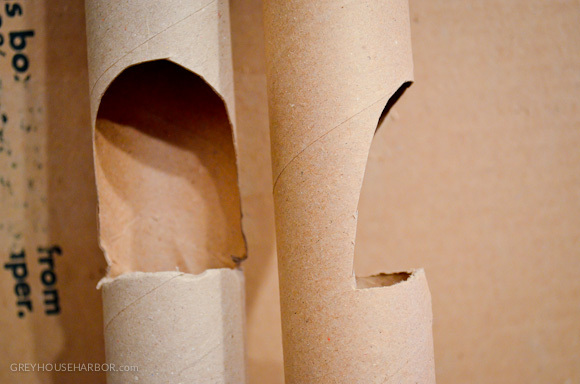 For the blade lift cylinders, cut this shape out of both wrapping paper tubes, about 8″ from one end. This will allow them to fold down nicely. 13. To attach the tubes to the bulldozer body, trace the tube circle where you want them to be on the top of the bulldozer. 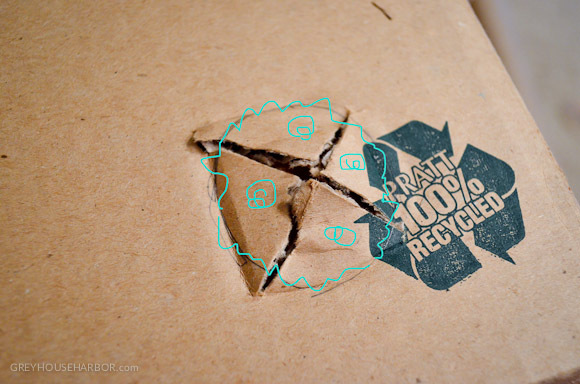 Cut an “X” shape through the circle. Generously apply hot glue around the circle and in the middle of the triangles. Place the tube on top and push the triangles up inside the tube. Run a bead of hot glue around the outside too. Now all it needs is paint! It’s easiest to paint all the parts separately before hot gluing them together for good. Amazing what some color can do! 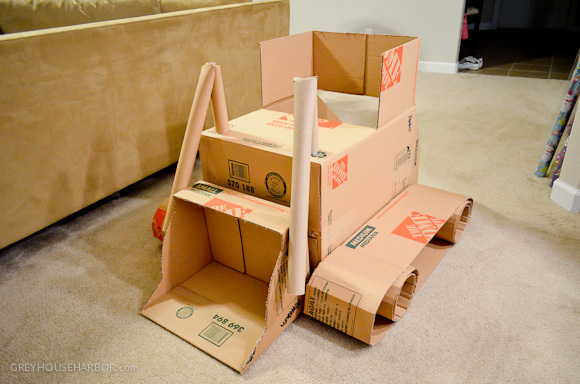 Using another large and 2 small boxes, I also made a dump truck. That step-by-step is HERE. 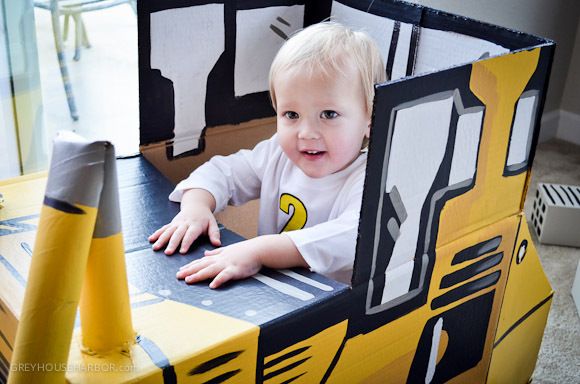 Paint a few smaller shipping/diaper boxes and you’ve got a complete construction site for your little crew. This is really amazing, as I have said before, what very lucky little children they are and of course the parents are very lucky also, really enjoy your blog. how much paint did you use for the bulldozer? Hi Nadine. Paint goes a long way! I painted the whole thing with three tester sized (8 oz) jars. Two yellow and one black. 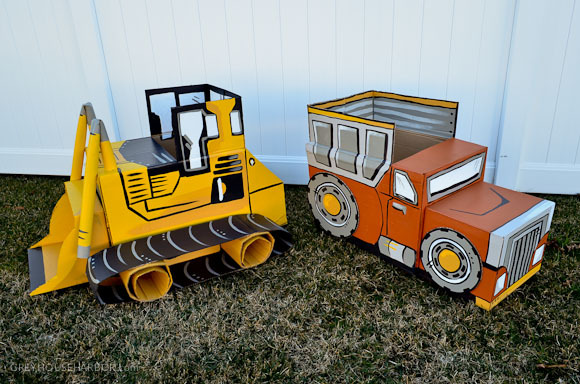 Do you have the plans for the dump truck? If you are in the USA, you can purchase them for a couple dollars each at Home Depot. I did my son’s 4th birthday n Disney pixar Cars Themes and made alot of box cars out of cardboard boxes n came out really neat. 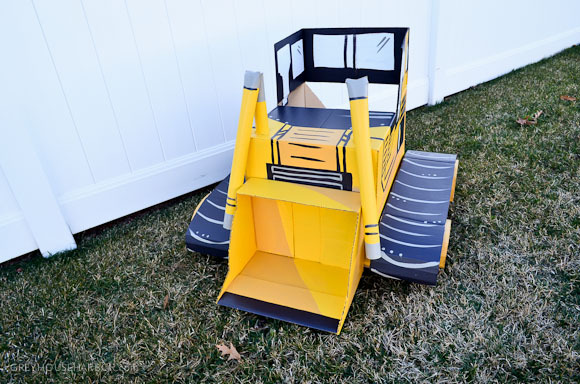 Even made a bigger Mack (semi) .. lovin these construction ones thanks for sharing I just might have to try em for my 2 yr old who is turning 3 soon! I love both the bulldozer and dump truck. Just wondered if I could have the same effect with spray paint? Hi Brittany! Spray paint is pretty ineffective on cardboard. Because it absorbs unequally your project will end up splotchy. Plus, you’ll go through a ton of spray paint just trying to get an even look. Not worth it when you’re shelling out $4/can. Stick with those “tester” sizes at most most home improvement stores and you’ll only need 2-3 of them! I love It! I’m 11 years old, and I’m going to make just for fun! I love Construction vehicles! Sami, thanks for taking the time to comment! I hope you have fun making yours! Thank you very much! You are so nice! I hope you have fun too! Great! I just bought the boxes! I’ll let you know when I will start to build! I just started to build! Hi Sami! Sorry I didn’t get back to you sooner. Were you and your mom able to figure it out? Let me know if you have any more questions! Hopefully I can see a picture of your finished dozer. 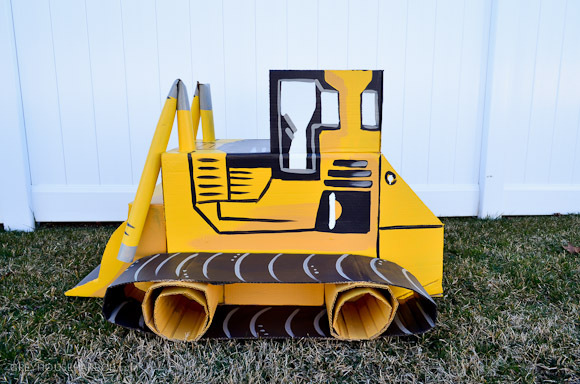 + You are going to see a fully finished picture of our dozer! Woo-hoo! I’ve just finished a lot! I’m finished with the small box, and the big box, and now, tomorrow, I’ll start with the medium box! I’ll let you know when I’m done! I’ve built the the tracks, and today I’m going to glue them on the the bulldozer! I am really almost don,e and ready for painting! Woohoo! So awesome! You’re making great progress. I can see you originally posted this a few years go but notice that you responded to another comment just a couple of months ago, so I’m hoping you may have an answer. 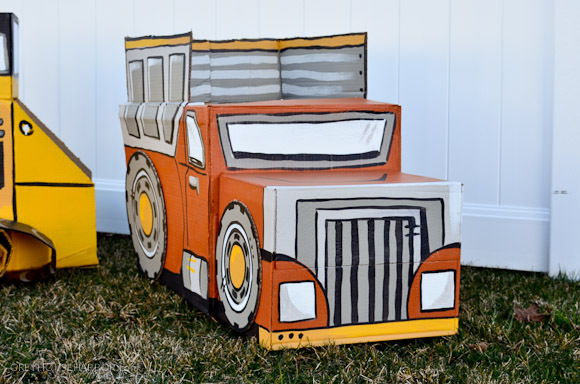 My 4 year old is in LOVE with construction trucks and I think I may make this for him but wonder if I could cut the bottom out of the main piece and add straps to the top with some grommets. once assembled is this very heavy that the front may not be supported by the hot glue or is it pretty light and sturdy? 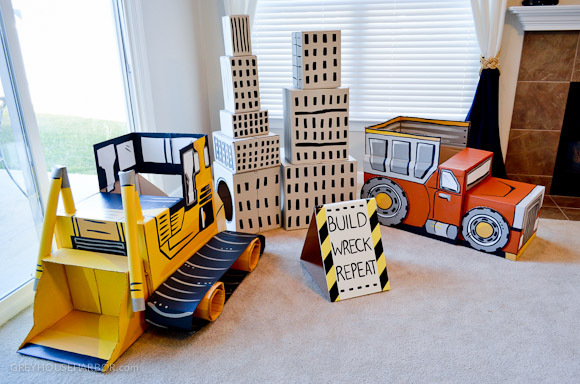 so perfect use of cardboard.Really liked the idea.Will surely going to try this for my kid’s 5th birthday celebraion.I love making things and decorating the house.This will be perfect theme party for my kid.He will surely going to have bash with guest and his friends. 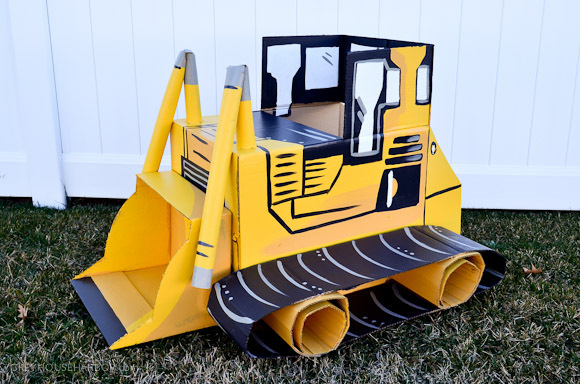 I just made the bulldozer for my son’s 3rd birthday. Fantastic instructions, thanks much! Although, I will say, you made that paint job look waaay easier than it really was for me. :-) I left out a lot of the details, and it still looks good. 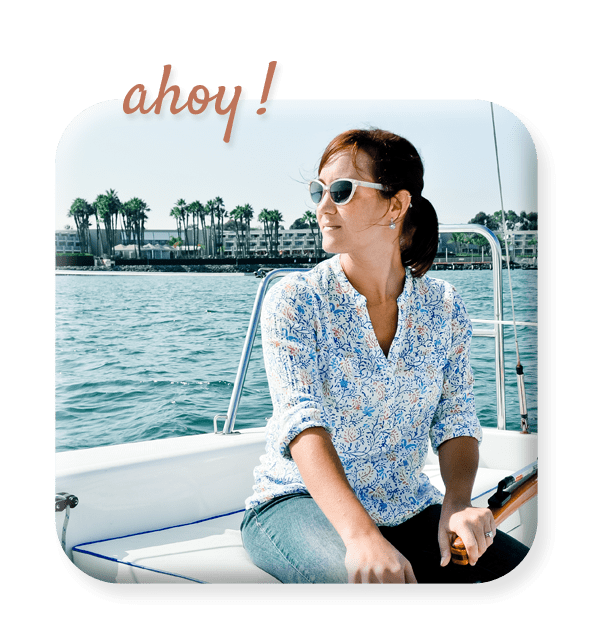 Hi Arthi, I’m so glad you found my tutorial and decided to give it a shot! It’s a fun build, but I will agree with you that the painting is the most tedious part. :) Thanks for coming back to share your story and Happy Birthday to your son! How cool! How long do you think this project takes? Cutting the box took me one afternoon, but painting it was another couple evenings. So maybe 7-8 hours total? Thanks for the detailed instructions. I enjoyed making this for my grandsons birthday party. I was sad to see it get destroyed so quickly but, I got some great pictures beforehand. You’re welcome Michele! So glad you had a fun time creating it. 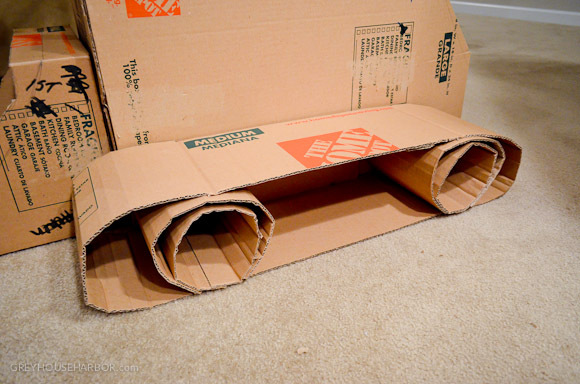 Untimely deaths are a definite disadvantage to cardboard creations.